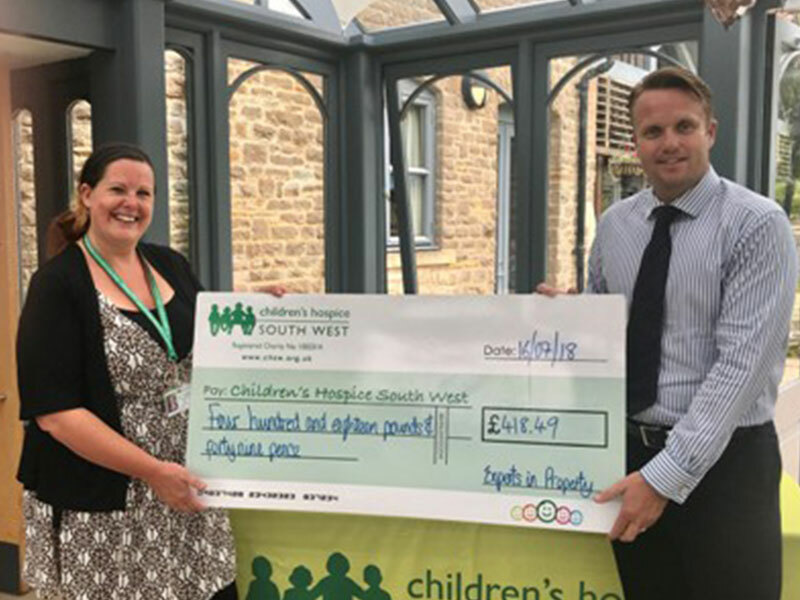 The Experts in Property, the Westcountry network of independent estate agency offices, raised almost £420 at a recent event for its nominated charity, Children’s Hospice South West. Operating three hospices in the region, Children’s Hospice South West provides a range of services for children with life-limiting conditions and their families, including 24-hour palliative and end of life care, and support for parents and siblings as well as help, advice and support in bereavement and beyond. The charity receives a donation every year from the network’s annual event, at which a prize draw is held to raise funds. In 2016 the donation was presented to Little Bridge House Hospice in North Devon, and in 2017 the funds went to Little Harbour Hospice in Mid Cornwall. This week, Nick Todd, branch manager of the Portishead office of Westcoast Properties presented the donation to Amanda Gallagher at the Charlton Farm Hospice near Bristol. Charlton Farm sits in beautiful surroundings in the North Somerset countryside with views over the Severn Estuary. A place of love, happiness and friendship, the hospice helps and supports families who face the emotional and physical strain of caring for children who, sadly, are not expected to live into adulthood. With a home-from-home feel, Charlton Farm has eight child-friendly rooms and accommodation for parents and siblings as well as playrooms, a spa bath for relieving stiff joints and muscle spasm, a sensory room, a soft play area, a games room, cosy places to relax, and a large open plan kitchen and dining room which forms the heart of the house.